Family-run farm and farm shop White Row, based in Beckington, has scooped another award to add to their other award wins. The latest sees them win the prestigious Best Farm Shop in the South West region awarded by food and drink organisation experts Taste of the West. This follows on from being given a ‘gold’ label three months ago by Taste organisers. 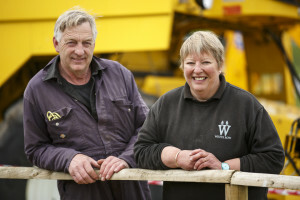 With such strong competition in the South West for farm shops, owners Heather and Steve Tucker were delighted to be crowned winners in the category. Heather said, “We are so delighted with our different award wins this year, but a really cracking result to be the best farm shop in the whole of the South West, and to have been awarded this by Taste of the West, such a fantastic regional food organisation.